The few exercises that are worth doing are the exercises that provide the most bang for your buck. I've put together the 80/20 rule here and listed some very effective exercises that some are afraid to try. Read on for more. While there are literally hundreds of strength training exercises to choose from, very few are actually worth doing. The few exercises that are worth doing are the exercises that provide the most bang for your buck. In other words, the few exercises that are worth doing are your ticket to massive increases in strength, size, and or muscular conditioning depending on what your goals are and how the exercises are implemented. I like to refer to these exercises as the "20% Club." In the business world there is a phrase that 80% of business comes from 20% of your clients or customers. As a result smart companies keep the 20% members happy. Unfortunately many companies make the mistake of showing more concern for potential customers rather than current customers. More often than not these companies do not last too long. Many companies that have a sales team also realize that 80% of sales are produced by 20% of the sales team. Thus, it is smart to keep the 20% people happy and incorporate incentive plans to get them to stick around. A similar philosophy can be applied to productive strength training. Trainees that ignore the 20% exercises that provide the most bang for the buck are the same trainees that never make any meaningful progress. They are neglecting the exercises that provide the greatest benefit. Big mistake! They fail to realize that the "20% Club" exercises will produce 80% of their gains. Actually they may even provide 100% of your gains. I get a ton emails from people that are incredulous about the benefits of training programs that emphasize compound exercises. Compound exercises work several muscles at a time. Some great examples are: The Clean and Press, Pull-ups, Squats, and Deadlifts. Many men do not believe they can get big well developed arms without doing any isolation exercises. On the other hand, many women do not believe they can tone up without focusing on isolation exercises for the glutes, inner thighs, and midsection. Of course, the reality is much different. Kettlebell Swings for example will do much more for solid glutes than Leg Extensions. Just ask Senior RKC Brett Jones who has his glutes squeezed by his male and female clients on a daily basis (mainly male clients). Fitness star Pauline Nordin swears by deadlifts for building rock hard glutes and hamstrings and she certainly has the results to back it up. Weighted pull-ups will do much more for building big biceps than barbell curls and Military Presses are much more effective at blasting the triceps than Triceps Push-downs. Regardless, of the prevalence of information highlighting the benefits of compound exercises, I continue to get bombarded with emails from trainees that want to know the secrets for well developed arms. They are often shocked when I state that I do not do any bicep and triceps isolation work and spend 100% of my time on compound exercises. Moreover, I rarely include isolation work in my client's online programs. Instead, I focus on exercises that provide more value. Not only is this extremely effective, it is also a time efficient. You can get a full body workout with three exercises or less and have more free time to enjoy other activities. Great news for people that have a life outside of training and bad news for stimulus addicted trainees that have no life outside of training. This exercise is so powerful that top strength coach Pavel Tsatsouline wrote an entire book about it, the classic Power To The People. 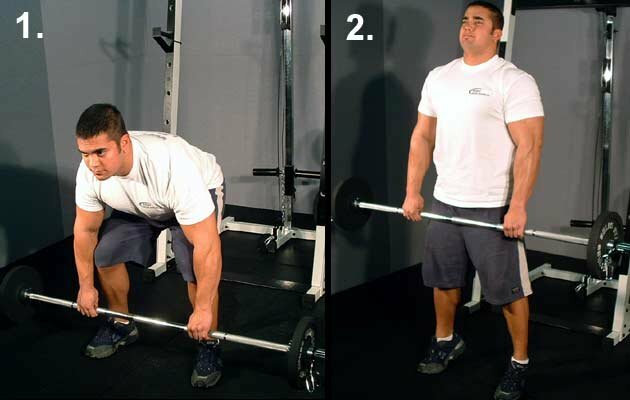 The Deadlift works every muscle in the lower body and a ton of muscles in the upper body. It is a powerful exercise and an exercise that all men should be doing who train with barbells. Yes, ladies you should be doing it as well as no other exercise will work your posterior chain as effectively as the Barbell Deadlift. Since I train primarily with kettlebells, I like doing high rep Kettlebell Deadlift sets with my 105lb bells. I do 2-3 sets of 20 or one set of 40 as a finisher at the end of my strength workouts. Kettlebell exercises such as heavy Double Swings, Double Snatches, and Double Cleans also offer many of the benefits of the Barbell Deadlift and are acceptable alternatives. No other exercise will do more for building powerful legs and overall size than the barbell squat. Why do so many trainees avoid them? Because they are brutal and most people are lazy and lack mental toughness. You can do sets of curls all day long without breaking a sweat. However, one high rep set of barbell Squats with bodyweight on the bar will leave most trainees smoked and begging for mercy. The payoff for the suffering? Massive gains in size and strength. What about ladies who do not care about strength and do not want size? Well every lady I know wants a great pair of legs, and no exercise will get you there faster than the Barbell Squat or at least some version of the squat. Ballet dancers do tons of bodyweight squats and have incredible legs. At this point you may be wondering where all of the upper body exercises are? Lets drive an important point home before moving forward. The majority of your body is not in your upper body. percent of your body's total muscle mass. in your body's total muscle mass." Dr. Sears goes on to state that working the quadriceps and hamstrings are the keys to building substantial muscle mass. Yes, men I hate to tell you this but doing twenty sets of curls and fifty sets of triceps pushdowns are not the secrets to building a powerful body. In fact for most trainees doing any isolation work is a waste of time. Focus the majority of efforts on Barbell Squats and Barbell Deadlifts. Yes, ladies, this advice applies to you all as well. One exercise that falls within the 20% club and provides the best of both worlds is the Clean and Press. The Clean and Press is so effective that you could build an entire program around this exercise. In other words, just do the Clean and Press with heavy weights two to five times per week. Again the frequency and intensity depends on your goals, individual recovery abilities, and several other factors that my online clients know about. I love this exercise and as many of your know, I do most of my weight training with kettlebells. Thus, I do the Double Kettlebell Clean and Press a great deal. In fact on days in which I am really busy, I just do Double Clean and Presses though out the day (Pavel's GTG program). For example, I will do five sets of four on the Double Clean and Press with 88lb kettlebells during the day. I just leave 30 minutes to an hour in between each set and do 5-6 sets total. In fact I am going to do a set right now and will be back in a minute. Okay I am back after a great set and a nice CNS boost. The Clean and Press works the legs, core, back, shoulders, and triceps. Push your hips forward and look up at the barbell as it goes up and your bring the chest in as well. Recently, bodybuilding legend Franco Columbu told me that he and Arnold used to treat Standing Barbell Presses as an upper chest exercise. Franco stated that it is one of the best exercises for well developed pecs. I am not a bodybuilder as strength is my main focus, but I do agree with Franco that the Press is a great drill for pecs. In fact I rarely ever do floor presses or bench presses and spend most of my pressing time on some version of the overhead press. Many of the old-time strongmen used high rep Clean and Presses with heavy weights as an overall body builder or what I like to call a "man maker." How come no one does high rep clean and presses anymore? For the same reasons why most trainees do not do barbell squats, they are damn hard. Of course, once again the pay off is incredible gains in strength and depending on how you train and eat, size as well. Mike Mahler is a certified Russian Kettlebell Challenge instructor, strength coach, athlete and freelance journalist.